DCF employee do not get it." 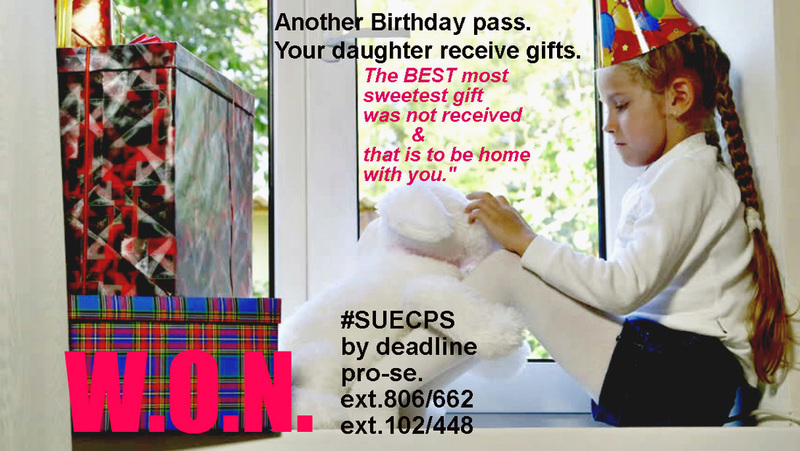 pray for all who are suing CPS employee BEFORE one's deadline." pro-se method.If our owner, now going for her law degree,juris doctor,if she was able to do so, with her daughters, then, there is no reason why you're not able to do the same! Good luck. Be sure when calling in, for owner and her e-staff @ WON to implement e-help form by clicking on the Facebook- contact us button. Fill out completely then click on "submit button" and call in 20 minutes after such implementation of our required e-form to begin same day your 1-on-1 POWER session. More are learning and in a timely-fashion and filing suit. As a lawyer on our popular FB page once said publicly,"Sue em." Sue em all and sue them all over the place nationwide while you still have time to do so. "He was right. Thank you sir." UPDATE on another family who sued and won,for which was later made publicly once it was verifiably settled$ and we are so happy for her because she did not "sit online"complain and do nothing,wasting time. SHE FILE her suit the(right way)and won." Free from harm by Department Children Famlies/County, who assume they again had the right to come into one's life and remove such child from a loving INNOCENT good parent. Such lawsuit for damages as publicized was won against such defendants,and we are so happy Mrs.Lopez was able to realize she CAN sue, did sue and in the end she WON. Mrs. Mirtha Lopez won when she was force to live (temporary situation) in a hotel west coast. She had her child who clearly were not being abused and or neglected at any time. Many have to stay temporarily in a hotel." CPS social worker was informed and removed her children along with citing under PENALTY of PERJURY "children were living in dangerous environment and make reference to "vaccination"and or therelackof; along with other false various allegation(s)for which were harmful to the parent." Such parent of such INNOCENT file her lawsuit in a timely fashion and she won,as her entire family almost 1 million dollars." She lost her children for in totality FOUR months and was able to win almost ONE MILLION DOLLARS. Hours of operation: 10:a.m.-eastern-10:45 p.m. HOLIDAYS vary. Weekends until 7 p.m., and 10 p.m.West Coast. 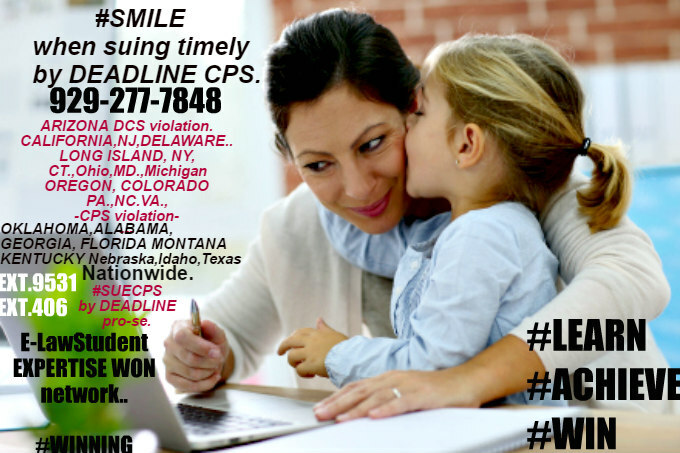 When suing for civil right damages for a violation against DCFS, DCS in Arizona,California,Indiana,to Maryland,NJ,NYC,PA.Massachusetts Oregon,Washington,Virginia,DSS Westchester,to DSS in North Carolina, nationwide, remember DEADLINE do exist. Do not miss yours by not suing when injured,and harmed by C.P.S., good luck.